This week the ruble has retreated against hard currencies, possibly marking an end to this year’s spectacular rally that made it the world’s best performing currency. 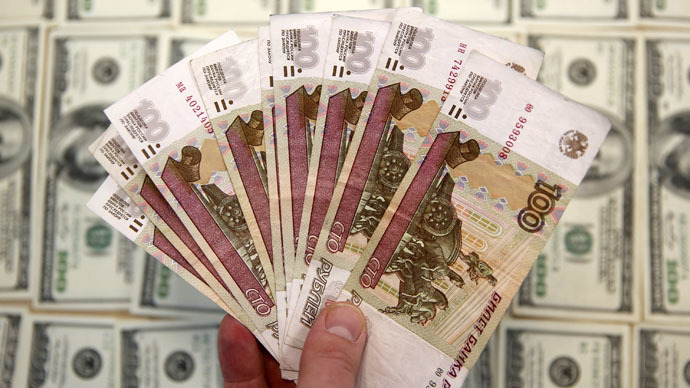 The ruble had dropped to 52.71 against the dollar and 57.79 against the euro by 11:50am MSK on Friday at the Moscow Exchange, from the 49.8 and 54.8 against the dollar and euro respectively on Monday. Experts agree that the end of a tax period in Russia that always supports the ruble and dollar purchases by the Central Bank of Russia (CBR) have weakened the currency. During the week, the emerging FIFA scandal, which saw some of its top officials arrested over corruption charges, also drove the ruble down lower on May 27. However, Russian officials have said the scandal won’t scupper plans to host the World Cup in 2018. Crude oil prices, inherently connected to the ruble rate, have also shown a negative trend this week. Brent Crude is trading at $63.19 per barrel on Friday, losing more than four percent over the week. The drop is linked to reports that Iraq is going to increase its oil shipments to a new record high in June and rumors that OPEC won’t cut the crude output at its meeting on June 5. However, Russian experts and authorities have been stressing that the link between the ruble rate and the oil price has weakened. Low oil prices are not a tragedy for Russia, said Russian Finance Minister Anton Siluanov on Friday, speaking at an annual economic forum in Vladimir, Russia. The ruble became this year’s best performing currency since hitting rock bottom against the dollar on December 16, when it lost more than 20 percent, with one dollar buying 80 rubles.